Notes | In the world of photography, what separates Allard and makes this successful photographer of the photographic essay unique? How did he start out? Who and what were his influences? How does he get work and complete it? Inside this book we find answers to such questions. And in getting to know William Albert Allard, the reader learns an enormous amount about the world of magazine photography and the photographic essay. Comments | [03/16/09] This book is a great source for the conflict and issues that come with dealing and negotiating the struggle in narrating with a lens. More specifically the perspective in dealing with the subject matter. I have reread this piece several times mainly because I enjoy the personality that comes from the text. The best result from this piece is how the words and images compel one to follow suit and emulate with your own effort. Comments | [12/22/04] Over the years, this might just hold up as my all-time favorite photo book. It is so well tailored to the interests of young photographers and full of great work. This is an insightful look into the way a National Geographic photographer thinks and works. Allard knows color, timing and human nature. If you ever dreamed of working at he Geographic, this is your book! Comments | [08/11/04] Bill Allard is one of the finest color photographers ever. He uses the color to communicate on a whole different level than the rest of us mere mortal photographers. He also gives more insights into working with a client. Comments | [10/26/02] I can't agree more with the previous posts. I managed to dig up an old copy somewhere and it is great - I got fired up about some projects I'm working on. If you can match it up with Allard's Portraits of America, the insight is invaluable. Comments | [10/22/02] The definitive book on how a great photographer works. Allard gives the reader every detail, right down to his film choices. IMHO, Necessary for any photo library. Comments | [10/04/02] This is a GREAT book. This was published in 1989 as part of the American Photographer Master Series. Too bad they stopped this series because they did a terrific job with this book. 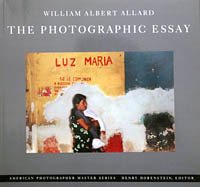 In this book you get to see many of Allard's classic photographs and you also get to read the stories behind what went into photographing the wonderful essays he did on the Basques, The West, Mississippi, Peru, etc. Don't hesitate! If you are a student or a photographer who wants to improve your photo essays you need to find this book ASAP for your bookshelf.